My research focuses on two main aspects: plant community assembly and interspecific plant trait relationships. Within the first research topic I study assembly rules in plant communities using null models, i.e. randomizing community matrices to compare observed and expected metrics that capture community structure. For this purpose I use vegetational data from a wide range of sources, including vegetational databases. Trait data of the occurring plant species are also considered to tackle the question what functional processes drive observed patterns in community structure. The second topic mainly includes research on the correlation between the mycorrhizal status of plant species with other biological and ecological plant traits. Basically we are interested in the question how plants that host mycorrhizal fungi are different from plants that do not, and if these plants benefit from the mycorrhizal symbiosis with regard to their ecological amplitude. 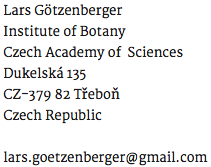 As a continuation of my PhD thesis I am also still involved in research on the relationships between traits concerning reproductive and floral biology that are connected to plants mating systems. While I am neither a statistician nor a computer scientist by education, I have a broad interest in the application of advanced statistical methods to ecological data, programming in R, and the storage of biological and ecological data in data bases. Lars Götzenberger Blog at WordPress.com.